NOTE: If you are coming by car for the tour and wish to hang around and ask questions, please park curbside or the adjacent neighborhood and not in the main store lot on Coop Tour day so regular customers can get in and out quickly. The following are featured for our coop stop! Mike the “coop guy” to answer questions about coops – he’s an expert! Ask him about building your custom coop for your yard! Mike the “bee guy” to answer your bee keeping questions – Check out complete bee kits with hives and gear to start your bee career available at the store! 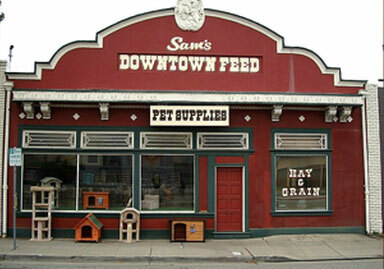 Sam’s Downtown Feed will be offering free chilled water for Tour De Coop participants and help answer your questions about backyard urban farming and the equipment needed.